Journal of Learning Disabilities, 1987 Jun-Jul;20(6):331-5, 346. 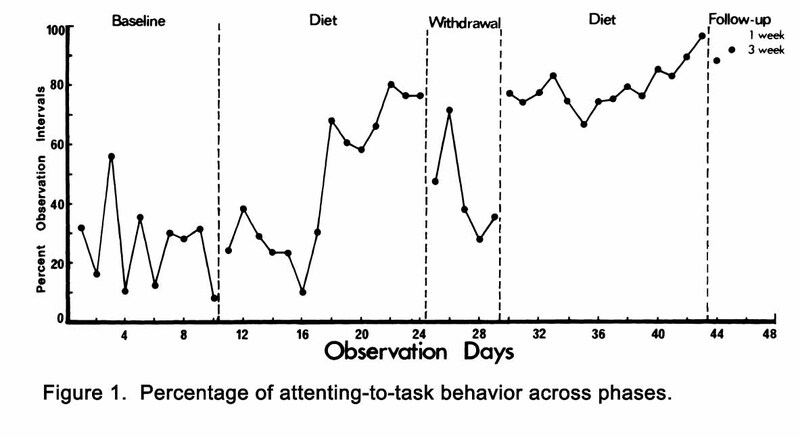 A single subject ABAB (on-off-on-off) design was used to test the effectiveness of the Feingold (K-P) diet in the treatment of a 6-year-old hyperkinetic male who seemed to be diet-responsive. His behavior was measured by classroom observations and by teacher and foster-mother reports. It was concluded that the K-P diet was effective in controlling the boy’s hyperkinesis. This entry was posted in 1986-1990, ADHD, Diet Studies, Hyperactivity, Research Studies. Bookmark the permalink.